Welcome to the Blomidon Inn’s “House of Gifts” online. Click on any product below to see a detailed description of that product and the option to add it to your shopping cart. The first time you view your shopping cart you will be asked for your delivery area. You will be able to change this later if you want to send the item to a family member or friend directly. You will also be able to add seperate delivery locations for each gift selected. Payment information will not be requested until you have finished shopping. b-a specified service such as lunch, dinner, dinner with wine, a guest room, an overnight package, or a romantic interlude, etc. 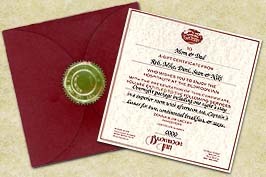 The certificate is then enclosed in a burgundy folder and sealed with a gold Blomidon Inn seal.